On Saturday 5th July Mirvac released 15 Ready Homes at The Avenue. Alex Avenue, a 300-lot development in the North West Growth Corridor, has attracted strong demand since its initial launch in May 2013. The Ready Homes release on Saturday was sold directly from the Priority Customer database and sold out the morning of release day. 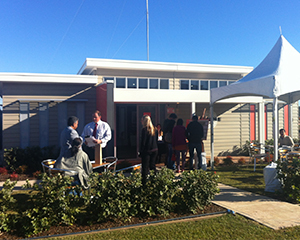 Purchasers on the day relaxed in the sun whilst enjoying a cappuccino prior to selecting their new home overlooking the proposed 1.2 hectare park, featuring a children’s playground, walking and cycle paths. With the first residents anticipated to be settling into their new homes this September, the new community is rapidly taking shape.